I read the article by Carol Goar quoting depressing sentiments about young people from MPP Julia Munro. While I feel a sense of optimism that issues of poverty and inequity affecting children and youth are being discussed, I fear the state of political will. As a young person I urge politicians to stop the rhetoric of youth incompetence and apathy, and start voicing belief and encouragement. Campaign 2000 just came out with a national report card on Child & Family Poverty titled Let’s Do This: Let’s End Child Poverty for Good. A call to action is heralded in response to the new governments – platform promise to create a national anti-poverty plan. Yet the plan must be accompanied by thoughtful, targeted action. As the report states, government must legislate change with a national Early Childhood Education and Care program, a comprehensive housing strategy and ensure the new Canada Child Benefit design reduces the child poverty rate by 50% in 5 years. Government should take seriously the fact that nationwide nearly 1 in 5 children live in poverty. Toronto itself has eight ridings with child poverty rates over 30%. 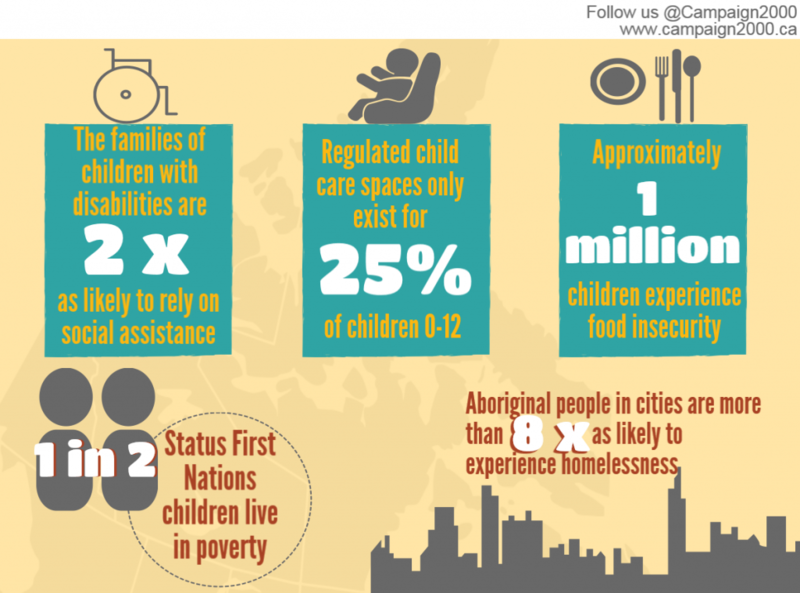 And disturbingly, entrenched poverty on First Nation reserves and systemic discrimination have created higher proportions of Indigenous youth in the care of child welfare and who are incarcerated. It is disheartening when politicians spout one-sided stories as their proof that a generation of youth is incompetent. Easily, an alternative narrative can be shared. Youth took action with their right to vote this election. Over 70,000 voted early on campuses and some estimates predict a 10% increase in turnout from 2011. You can find youth across Ontario and Canada working to take action and create opportunities where little exists. Take for example the nearly 700 youth that created the Y2K Strategy in Kingston to improve community environment, health, and wellness. Youth are often working hard and taking action, but their actions easily go unrecognized. Rather than sharing criticizing stories, politicians should focus energy to combat a youth unemployment rate that is almost double the national average. Politicians should address the student debt Ontario students face from paying the highest average tuition in Canada. Politicians should know that Ontario students would have to work a full summer at minimum wage just to afford tuition (let alone food, rent, books). Politicians should create opportunities for homeless youth, a large portion who fled experiences of interpersonal violence, emotional, physical and/or sexual abuse. Politicians should use this evidence to recognize the conditions that prevent youth from reaching their potential. That our own Prime Minister is the Minister of Youth and the Liberal platform committed to creating a Commissioner for Children and Young Persons gives a nod to the unique and pressing needs of children and young people. Let’s change the conditions of poverty. Let’s embrace encouragement rather than disbelief.